Instant Pot lentil tacos are a healthy dinner option! They’re a great vegan taco recipe that is filling, fresh, and flavorful! 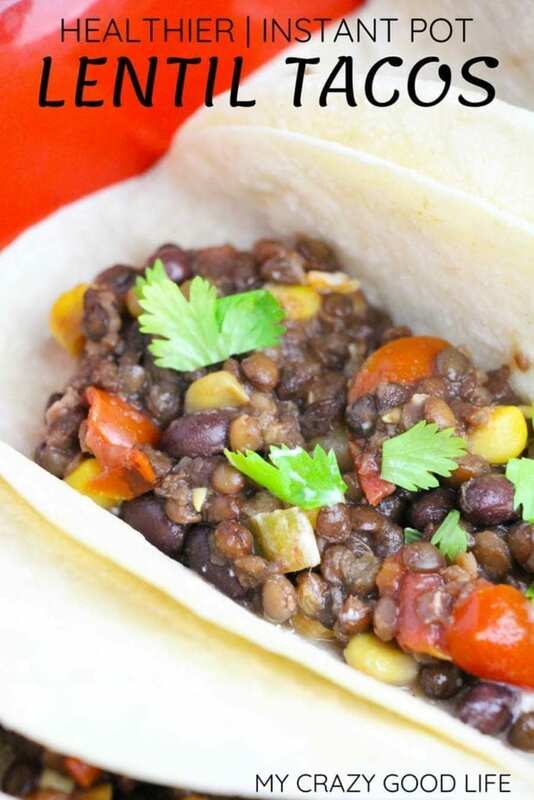 The whole family will love these healthy lentil tacos. 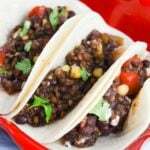 These lentil vegetarian tacos are a big hit in my house. The entire family loves when I make these! I love that they’re super easy to make (hint, it all goes into the Instant Pot) and that the Instant Pot makes it so simple to clean up! Making these lentil tacos in the Instant Pot could not be easier! You can use pre-cooked lentils but you don’t have to (Instant Pot magic, I know)! Doing natural release is necessary for lentils and beans so don’t try and rush that portion!! 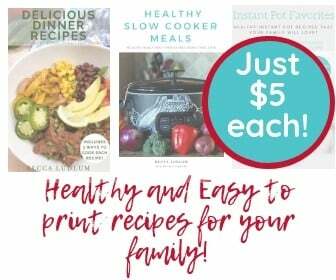 I use the 6 quart Instant Pot Duo to make my recipes but you can check out how to configure the recipe to other models here. Seal and allow to naturally release. Taste and adjust the seasoning before serving with optional garnishes of Greek yogurt, cheese and cilantro. What kind of tortillas should I serve these with? I love corn tortillas, and my new favorite way to make taco shells (that is so much healthier than the packaged ones) is to spray them with oil and “fry” them! You can also serve these with lettuce wraps or on a salad! 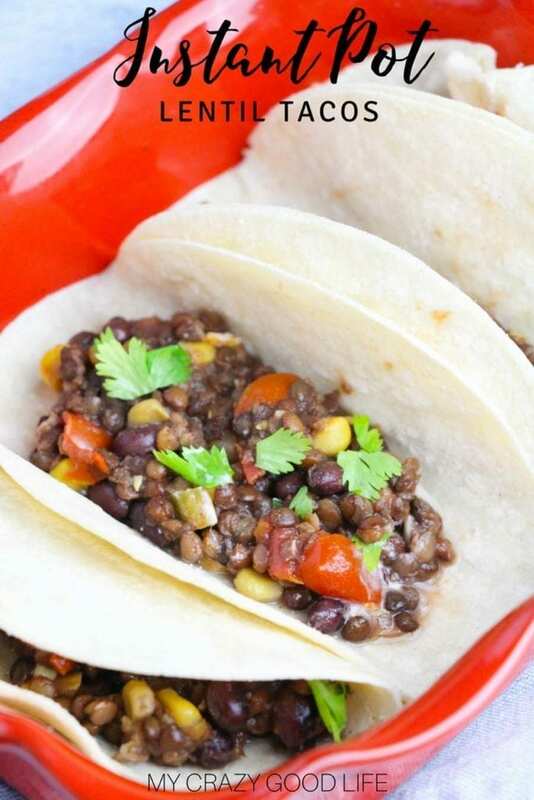 You can very easily make these lentil tacos as a vegetarian dish! Vegetarian tacos don’t have to mean tofu or a lot of extra work! 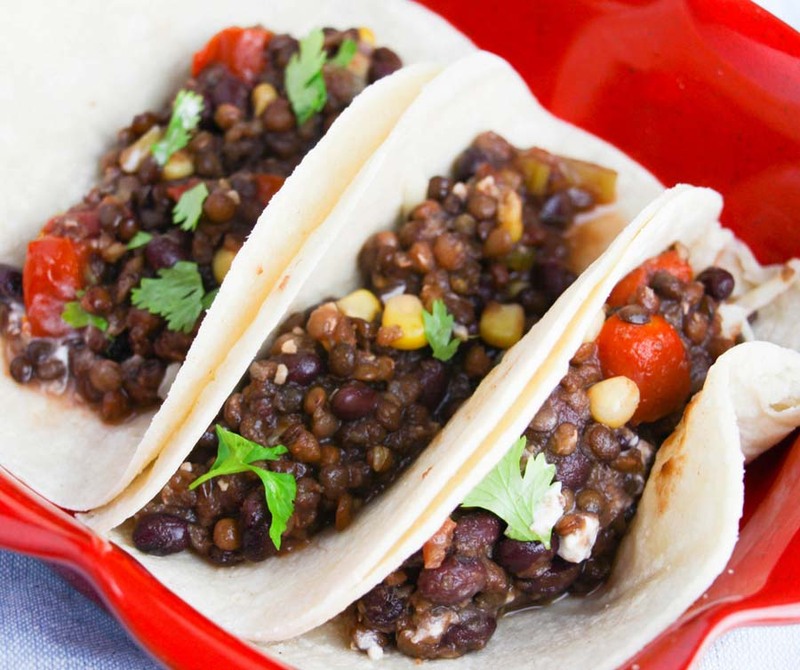 These lentil tacos are so delicious and healthy. Below you can see the ingredients and it’s easy to see how you can tweak these in a few small ways in order to make these lentil tacos vegetarian and even vegan. Is this a Vegan Taco recipe? Yup! Great for meatless Mondays, or any day if you’re vegan and avoiding meat. I’ve got a few 21 Day Fix Vegan recipes to share with you! The 21 Day Fix has a separate Vegan eating plan, but don’t switch in and out of it if you choose to have a Vegan meal here and there. You can’t count your protein carbs as protein unless you’re doing 21 days of the Vegan 21 Day Fix plan. *Lentils often double in size when cooked, so 1C lentils will = 4Y on the 21 Day Fix. If you think that your lentils more than doubled in size, account for that in your container counts. On the 21 Day Fix Vegan Plan, bump up your lentils to 1.5C dry, and bump up black beans to 3/4C. Previous Post: « Avengers: Infinity War Bonus Features You Can’t Miss! I’m assuming the black beans are also dry? I usually use canned for this recipe! I made this today and my teenagers devoured it! It was their first time having lentils and they liked them!